Property Management, New Construction and Investment Properties. We have also been voted "Best Of Delco" for 3 years straight! 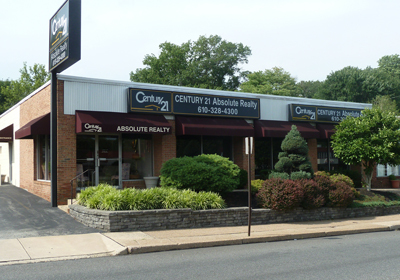 CENTURY 21 Absolute Realty is a top producing, long established Real Estate Company, specializing in Philadelphia Metro Real Estate, Chester County Real Estate, Delaware County Real Estate, Springfield Real Estate, Ridley Park Real Estate, West Chester Real Estate and Real Estate in and around the Philadelphia Area. Please explore our site to find out more about Real Estate in West Chester, Springfield, and Ridley Park. Our Real Estate agents are professionals in and around these areas and are waiting to hear from you. We specialize in residential sales, listings, relocation, property management, new construction and investment properties. CENTURY 21 Absolute Realty is a full-service real estate service that prides itself on quality sevice. Our job is to make your life easier. We do not stop until the deal is done. This is a full-service company with the most qualified trainers in the business. These trainers take pride in preparing every agent to be the best they can possibly be, there are no excuses in our business. Our office takes every customer's concerns and feelings to heart & we treat every customer like family-that’s what matters the most! Are you thinking of buying a home in the Delaware or Chester County area? Finding the right home can be a difficult process but no matter what you are looking for as experienced Suburban Philadelphia real estate agents we can provide you with the resources you need to make the home buying process simpler, from specific county neighborhood information, to tools to estimate your mortgage payments, and buyer resources and articles that will help you through the home buying process. Thinking about selling real estate in the West Chester or Springfield area? No matter which market you're in, you can use the marketing programs and experience of qualified West Chester and Springfield real estate agents like us to help sell your home quickly and at the right price. Learn more about our service, see information about recent home sales in Delaware and Chester Counties, or contact us to get started today! Are you interested in more Delaware and Chester County area details? Please take a minute and browse my local neighborhood and school details, real estate mortgage information and interactive maps for the suburban Philadelphia market. Thank you for visiting www.c21absoluterealty.com! This is a one-stop real estate website for all your home buying and selling needs in West Chester and Springfield. We are professional real estate agents who will help make your search for a new home an enjoyable experience. We encourage you to check out our website for local neighborhood and school details, mortgage information, interactive maps,listings of properties of homes for sale, plus many more features. Please feel free to contact us directly if you have any questions about the Delaware County or Chester County real estate market, or buying or selling a home in South Eastern Pennsylvania. Browse easily from your mobile device - text "C21absolute" to 8778 to install your free mobile app!